cherry tomato | An adventure with food. Or alternatively The Most Inventive Thing I’ve Ever Done In The Kitchen. And I didn’t use ginger. I didn’t even use chilli…! Preheat the oven to 220oC/425oF/Gas Mark 7. With a sharp knife, carefully cut slits all the way through the potato in a semi-regular pattern. 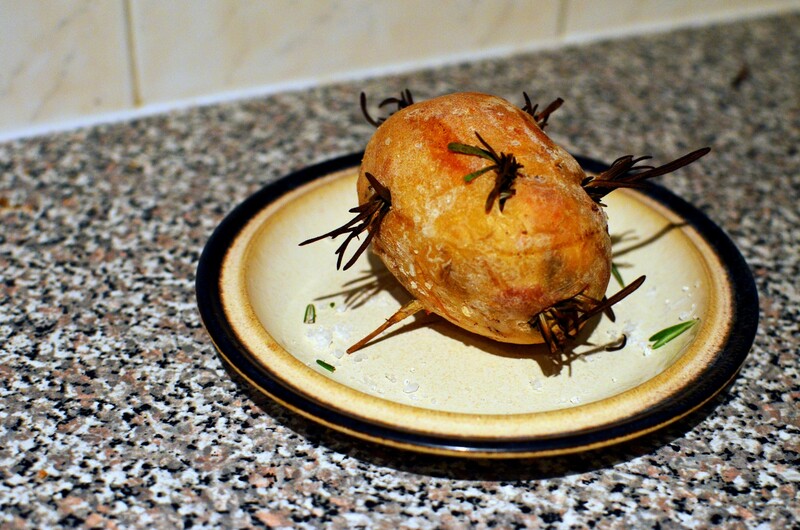 Optional: Spread a little rock salt on a plate, wet the skin of the potato and roll in the salt. Apparently this helps draw moisture out of the skin so it gets super-crispy. Put the baked potato in the microwave on the highest setting for approximately 5-6 minutes. Remove when the potato gives under a little pressure from your hand – but be careful, it will be hot! Put your potato into the oven for 30-40 minutes, until a nice crispy skin has formed. Be careful, leaving it too long will lead to a dried out interior – I’m sure you all know your ovens best so just cook as you would a normal jacket potato. Meanwhile make up your ragu. Heat a little olive oil in a saucepan and add the onion and garlic. Sweat for 6 minutes before adding a glug of balsamic vinegar. After a further couple of minutes add your tomatoes, tomato purée, a really good twist of pepper and a good pinch of salt. 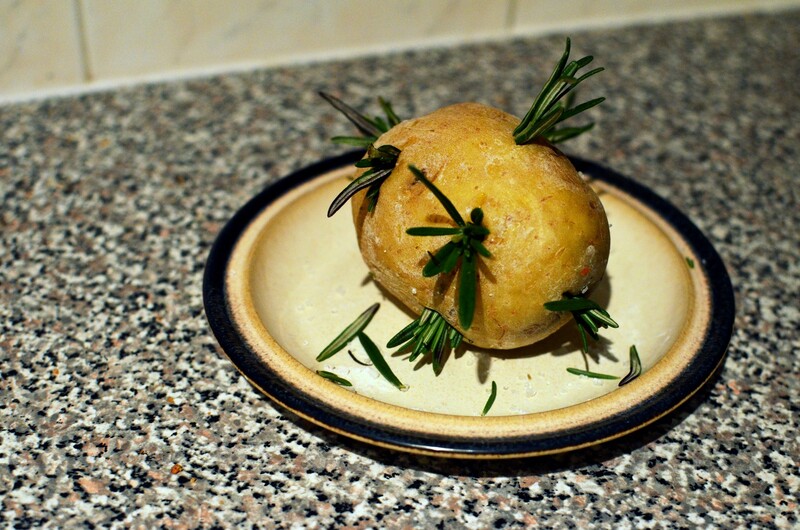 At this stage I also threw in the “leaves” of rosemary that came from cutting my rosemary stalks. Lower the heat, cover and stir occasionally. If anything starts to stick to the bottom of the pan, add a drop of water, stir and recover. Cook for approximately 15 minutes then remove the lid and reduce sauce to a really thick, sticky, gooey, gloopy, pan of wonderment. 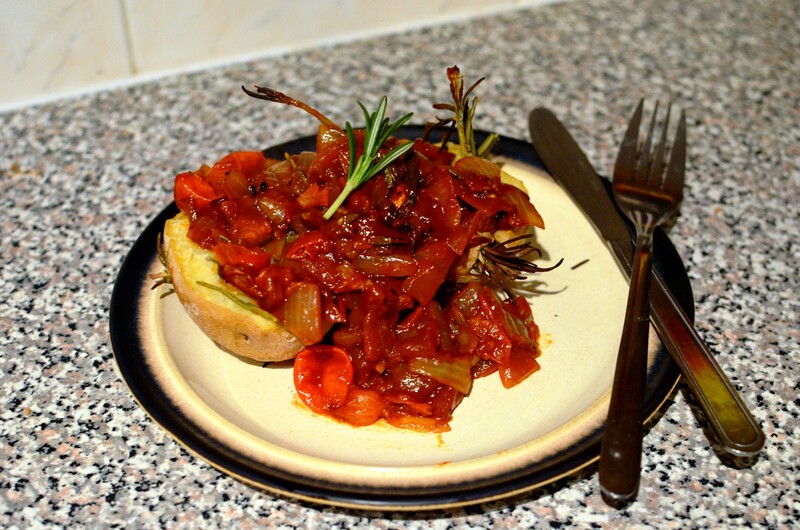 Cut open gently – you could remove the rosemary stalks if you want to but I chose to leave mine in and eat around them. Slather your potato with lashing of butter and top with the ragu. Simple yet damn delicious.